The word "approach" comes from the Latin propius, meaning "near"—in mountaineering, to get close to the climb, or what I go all the way up there for. And yet, I often feel nearer to the mountain when I'm on the approach trail—tripping over a gnarled root or reaching out to lean my weight against the trunk of a pine—than I do on the summit. By stepping around and among trees and their downed needles and branches, over mule-deer and elk droppings that are drying to powder, beneath woodpeckers knocking on trunks and squirrels chittering inside their nests, I find a growing sense of intimacy. Katie Ives described "The Art of the Approach" similarly in Alpinist 48, saying, "Slowly, through the soles of my feet, I regain the memory of contact with the world." On an approach, not only am I nearing the climb; I am making contact as I weave through the living mountain. Lodgepole pines have always been my signposts in the Rocky Mountains, symbols of the subalpine ecosystem. 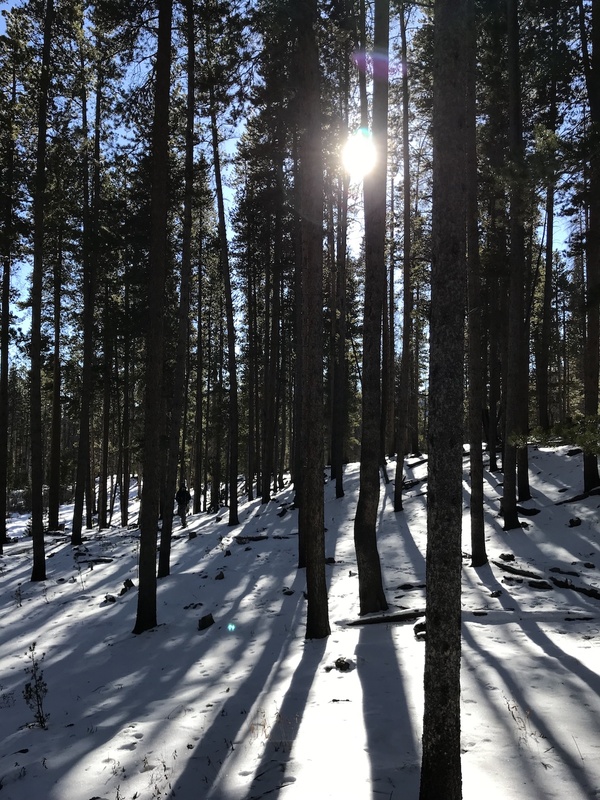 On the drive in from the Front Range, when I see the crowns of lodgepoles—thin within the hundred-foot canopy—I know I'm really in the mountains. They are the towering vanguards of the high forest, the tree line tree. Lodgepoles are the edge—the last trees I see on my way up the mountain, and the first I greet on my way back to the land of the living. As I navigate ever steeper terrain, every breath I pull in is air the pines have exhaled. In wet spring snow, I can almost smell the bark on the soaked lodgepole trunks—a muskier, woodier smell. On a summer afternoon, after toasting all morning, lodgepole needles smell caramelized by the sun, sweeten any breeze. Curious about the history of these trees in the Rockies, I learned that the name refers to one way Indigenous people who have called this area home (such as the Arapaho, Cheyenne, Comanche, Crow, Kiowa, Lakota, Nakoda and Sioux) utilized the tree—to build teepees. Many also used lodgepoles to construct travois by crossing the trunks in front of dogs or horses, and then tying their belongings to them in order to travel and change camps seasonally. I also read about how Union Pacific Railroad workers used lodgepoles to make railroad ties as they built the first transcontinental railroad in the late 1800s. In order to get these trees down from steep slopes, they constructed flumes, also out of lodgepoles. Streams, diverted into these flumes, then floated the long tree trunks all the way to the Wyoming prairie. 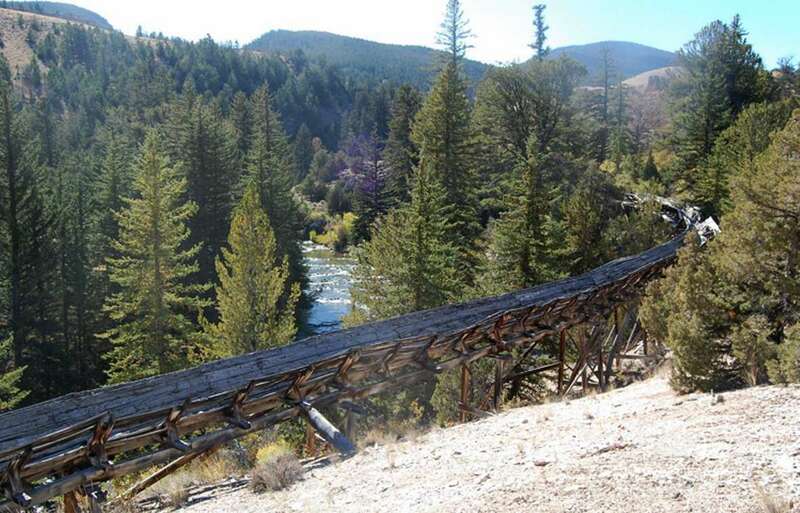 You can still find remains of the flumes in the mountains of Bridger-Teton National Forest today. I think one of the most radical things poetry can do is broaden the scope of intimacy. With this poem, I'm interested in exploring what we're really walking through when we approach these mountains. or frosts the bark's edges soft. skim over dead trees not looking down. Katherine Indermaur is the temporary assistant editor for Alpinist. Her poetry chapbook Pulse was recently published by Ghost City Press, and her writing has appeared in journals such as Poetry South, Voicemail Poems, Muse /A Journal, CALAMITY, and Borderlands: Texas Poetry Review. An MFA candidate at Colorado State University, where she was awarded the 2018 Academy of American Poets Prize, she is also the managing editor for Colorado Review.